You will be picked up at your hotel lobby and transferred to Shanghai airport. Be met at the arrival hall of Xian airport by our guide and transferred to hotel. After lunch, start our tours in Xian. First visit the Shaanxi History Museum, one of the four best museums in China, a quick way to learn about Chinese history. 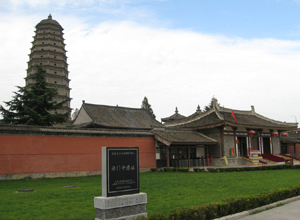 Then move on to the Big Wild Goose Pagoda, which is a elegant Buddhist architecture and is regarded as symbol of Xian. Continue to visit the ancient Chinese style Great Mosque in the Muslim Quarters. Take Dumpling Dinner and enjoy the Tang Dynasty Dance and Music Show as well. First, we will witness one of the eight wonders in the World-Terra-cotta Warriors and Horses. The undergroud army has guarded the Tomb of the first Chinese emperor for more than 2,000 years. After lunch, acsend the ancient City Wall. It is very pleasant to either walk or cycle on the top of Wall (bike rent fee excluded). Visit Famen Temple. It is renowned for storing the veritable Finger Bone of the Sakyamuni Buddha. After lunch, vsiit the Qianling Tomb, the co-tomb of Tempeor Tang Gaozong and Empress Wu Zetian, the only empress in Chinese history. Back to Xian after the tour. You will be transferred to Xi’an airport and fly back to Shanghai. Our Shanghai driver will meet you at Shanghai airport and transfer you to hotel.